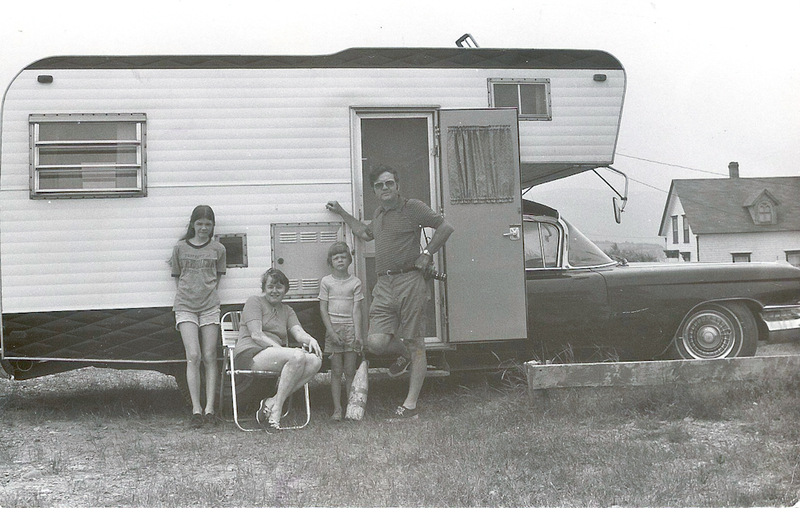 I haven’t gone camping since I was a kid, unless you count Camp Blogaway. But if someone were cooking fireside from this cookbook, I just might dig out my sleeping bag and hop on the trail. 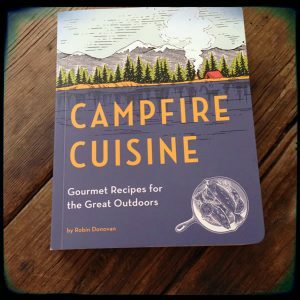 I reviewed and tested recipes from Campfire Cuisine: Gourmet Recipes for the Great Outdoors by food writer Robin Donovan. We’ll be giving away one copy of this cookbook on Friday, October 25th (our monthly giveaway for October). You see, this is how I grew up camping. That’s a ’59 Cadillac hearse with a camper mounted on the back. In this untrustworthy vehicle, we tooled around the countryside each July, stopping at every rest stop, historical market, and HOA campground east of the Mississippi. While we did buy fresh corn and raspberries from roadside stands, Mom mainly cooked things like Kraft mac ‘n cheese and Spam. I’ll never forget the contrast of the neon-orange “cheese” sauce against the turquoise plastic bowl it was served in. And, we had a stove, so we didn’t do the campfire cooking thing. What I love about Robin’s book is how she has combined unusual flavors with just a few ingredients, creating truly gourmet dishes that will hold up in coolers and on picnic tables. I tested baba ghanouj, as I am a sucker for eggplant dip. It was lovely and creamy, gone in a flash, and very easy to make at home using her instructions. I was intrigued by the potato and fennel packets, which cooked up delightfully in my oven. This dish absolutely tasted gourmet; it’s a perfect example of her smart-but-simple ingredient combinations working their magic. Finally, I tried the black bean salad pictured above. She was right, the flavor intensified wonderfully over three days, and the dish went together quickly. I would premix the spices in a zip-top bag and bring them along; this would be very easy to make on a picnic table. 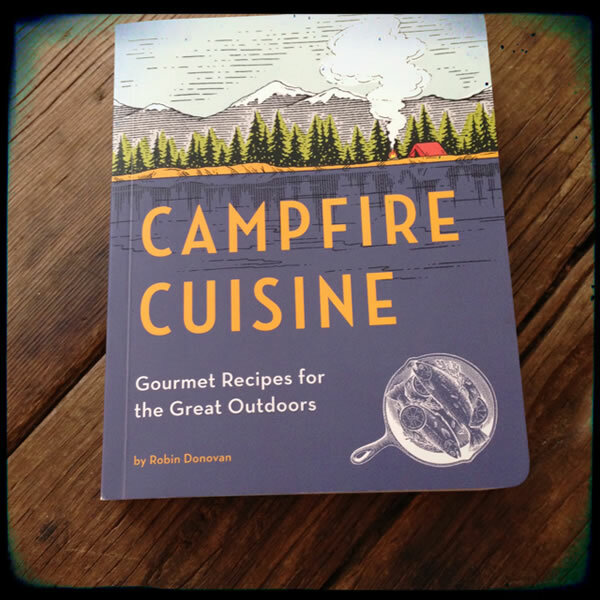 From Campfire Cuisine: Gourmet Recipe for the Great Outdoors by Robin Donovan (Quirk Books, 2013). Used with permission. 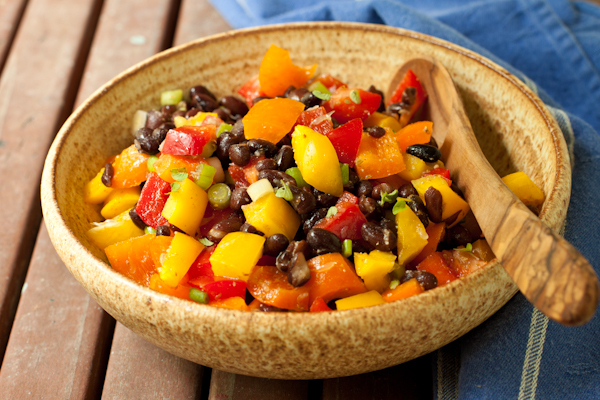 Mix the first six ingredients together in a large bowl, then add the beans, peppers, and onions. Notes: Make up to two days ahead; this improves with time. Use two differently-colored peppers for the prettiest salad. 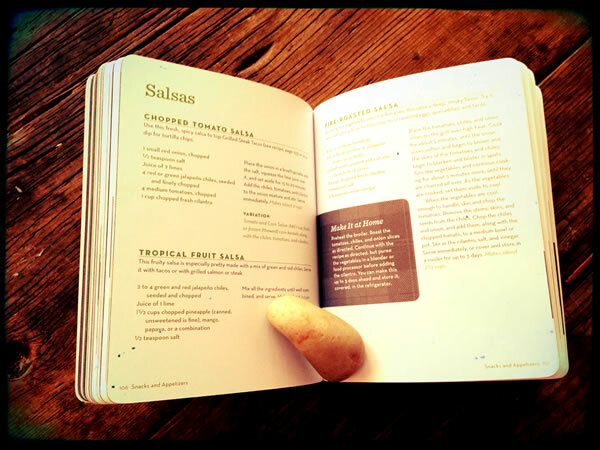 The book opens with a thorough discussion of food safety, gear, meal planning, and cooking outdoors. It’s clear that the author has lived these recipes and is writing from experience, not simply research. The recipes, approximately 130, begin with dressings, sauces, and marinades, then cover breakfast, sandwiches and salads, snacks and appetizers, entrees, veggies, grains, and sides, and desserts. Each recipe gives suggestions for a “make it at home” option, which I appreciated. The three recipes I tested were excellent, so I am confident in recommending the book. It’s a great size for packing, with the look and feel of a retro Boy Scout handbook with woodcut images sprinkled throughout. I wasn’t so keen on: The biggest issue for me is the design of the book. While I love the vintage look, it is difficult to read the recipes because of the typefaces and the color scheme. Green or gray type on white paper is difficult to decipher in my kitchen; I think it would be very hard to read by a campfire. Timings are not clearly indicated, and the serving size information is in light green type at the end of the recipe, so it’s tough to locate. Regular readers should note that gluten-free recipes are not marked, nor are vegetarian/vegan options. Anyone who loves to camp; this will definitely improve the quality of the food on your next camping trip! Just make sure you have a bright flashlight or lamp to read it with and you’ll be fine. Today’s post is part of our mission to help you rebuild your health through food and lifestyle choices. Look for posts on Mondays featuring gluten-free, sugar-free recipes made with healthy plant-based ingredients, Tuesday reviews, Wednesday essays, Thursday how-to’s, and Flashback Friday recipes. We’ll have monthly giveaways on the last Friday of the month.